In Connecticut, you may file a petition yourself seeking child support from a responsible party. This article discusses the form OCSE-OMB-0970-0085-U, which can be found on the website of the Administration for Children & Families, a division of the US Department of Health and Human Services. Connecticut Uniform Support Petition OCSE-OMB-0970-0085-U Step 1: Give your full name and Social Security Number in the space reserved for the plaintiff. Give the same information regarding the other party in the space reserved for the respondent. Connecticut Uniform Support Petition OCSE-OMB-0970-0085-U Step 2: If you are receiving any benefits, you are filing an IV-D case. Indicate which form of benefits you are receiving. Provide an IV-D case identifier number if applicable. Connecticut Uniform Support Petition OCSE-OMB-0970-0085-U Step 3: In section one, under "Action," give the full names, dates of birth and Social Security numbers of all children involved in this action. Connecticut Uniform Support Petition OCSE-OMB-0970-0085-U Step 4: Indicate with check marks whether you are requesting an establishment of paternity, an order concerning child, medical, spousal or other support, or other related actions. Connecticut Uniform Support Petition OCSE-OMB-0970-0085-U Step 5: In section two, provide all information requested about the grounds for seeking support. Connecticut Uniform Support Petition OCSE-OMB-0970-0085-U Step 6: In section three, indicate any additional forms you are submitting along with your petition. Connecticut Uniform Support Petition OCSE-OMB-0970-0085-U Step 7: Sign and date the form in the presence of a court official or notary public. 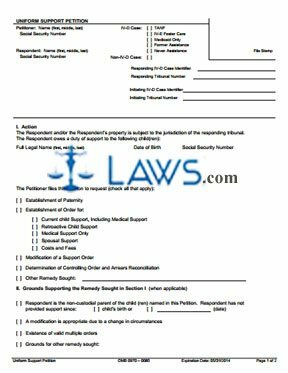 Your attorney, if any, should also sign and date the form at this time, as well as providing their bar number.